Intensive Care Medicine has just published an interesting short article, in which Drs. Jeffrey D. Edwards (Columbia University), Louis P. Voigt and Judith E. Nelson (Memorial Sloan Kattering Cancer Center, New York) summarize ten key points on the provision of palliative care in the intensive care unit (ICU). They argue that, to ensure the best care in the ICU, palliative care has to be part of the clinical practice. The holistic approach of palliative care is not only aimed to improve the quality of life of patients with a life-limiting condition, but can also help patients who are critically ill, and who may or may not be likely to survive. Palliative care as a medical specialty or sub-specialty is available in some countries, and a growing number of physicians are training in it where possible. However, a “primary/generalist” knowledge of palliative care should be the responsibility of all ICU clinicians. The authors recommend a “mixed model”, in which “primary palliative care” (i.e. general palliative care knowledge by ICU clinicians) is combined with the input of specialists in palliative care. Many deaths in the ICU are due to a limitation in life support. Therefore, critical care specialists must be aware of the ethical implications of withholding and withdrawing interventions, as well as of the pharmacological and non-pharmacological treatments to prevent, as much as possible, suffering at the end of life. It is important to have “clear, sensitive, and nuanced discussion[s]” about the patients’ values and goals regarding their wish to pursue (or not) intensive care interventions. Critical illness seriously affects both patient and family, leading in some cases to depression or posttraumatic stress (among other difficulties). The “risk and protective factors” have been studied, and some respond well to interventions. Palliative care offers a way to “help understand, anticipate, and address” the effects of moral and psychological distress, which constitute a risk for those working in the ICU. Interventions like mindfulness or normalization of grief can help ICU clinicians with their burden. 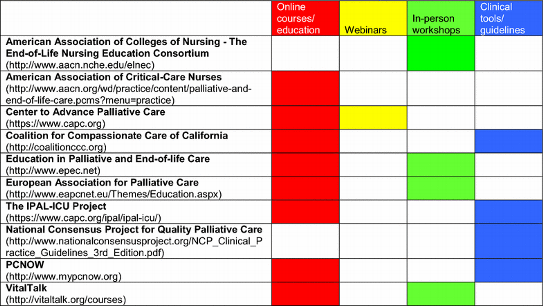 The article provides a list of examples of online resources where ICU clinicians can find courses, webinars or guidelines to improve their knowledge on “primary” palliative care. The authors note that nurses have a key role in providing “high-quality ICU palliative care”, improving communication between families, patients and healthcare professionals. The quality of care in the ICU can improve by using different systems to measure, monitor, assess and provide feedback. It has been shown that ICUs that incorporate in their practice palliative care interventions have better outcomes, including reduced length of stay, higher satisfaction, and better communication and decision-making. Overall, this article clearly proves, with evidence-based statements, that palliative care in the ICU is essential for the provision of excellent critical care.